I had the pleasure of sharing a luncheon table with Juana Martinez-Neal at the International Literacy Association conference in July. I so wish we would have had more time to chat — but thankfully, our conversation lasted long enough for me to ask her to be a guest for Friend Friday. 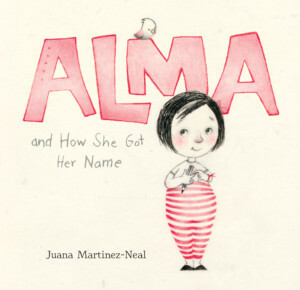 And even though she is incredibly busy, she graciously made time in her schedule to give us a bit of a glimpse into the story behind the story of Alma and How She Got Her Name (Candlewick). When I was growing up, my name Juana was always changed. I was called Kika, Ju, Juju, Juani, Juanita and a whole lot of other names that I honestly can’t remember. These names were all ways to escape having to call me Juana — since most people thought Juana sounded too strong and harsh. Nevertheless, Juana was my name. A name my dad gave me to honor his mother, my grandmother that I never had a chance to meet. I left Peru and moved to the US when I was in my mid-twenties. Not long after I arrived, I came to realize the name Juana was hardly ever used in this country. Juana came with no preconceived ideas. So in my new country, I was given the chance to fit into my own name. Fast forward a few years when I decided to create a book that I would both write and illustrate. 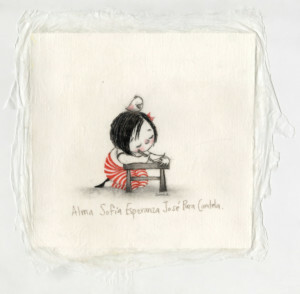 As I developed ideas, it was a natural step to tell the story of Alma, a girl who learns to fit into her own name. 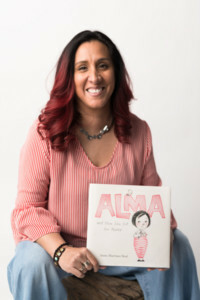 In my book Alma and How She Got Her Name(Candlewick 2018), Alma Sofia Esperanza José Pura Candela learns to love the fantastic name she is given, and she is given the chance to write her own story… when she is ready. Reading this probably oversimplifies the process of how Alma and How She Got Her Name became a book. This semi-autobiographical, very personal story was full of false starts, stops and delays. It is thanks to the patience and vision of Stefanie Sanchez Von Borstel (my agent) and Mary Lee Donovan (my editor), along with many, many other people who put their time and love in the book that Alma became the book it is today. They all saw something special in Alma, and I am grateful they did. Candlewick published both English and Spanish editions, and it was an honor to write in both of my languages. Look for Alma y cómo obtuvo su nombre (Candlewick 2018) at your bookstore or library. I hope you enjoy reading Alma. More importantly, I hope Alma is just a conversation starter, and that you get the chance to share the story of your own name with your friends and family. What is the story of your name? What story would you like to tell? Bio: Juana Martinez-Neal is the daughter and granddaughter of painters. She started her story in Lima, Peru, and then moved to the United States. The winner of a 2018 Pura Belpré Illustrator Award for La Princesa and the Pea by Susan Middleton Elya, Juana Martinez-Neal is still writing the story of her life, with the help of her husband and three children, in Arizona. Learn more about Juana and her work by visiting her website. You can also follow her on twitter and instagram.